What better time in the driver’s seat of the 2019 Chevy Traverse than November 2018 while receiving the announcement that General Motors plans to close up to five assembly plants in North America and end production of three Chevrolet car models – the Impala, Cruze and Volt plug-in hybrid. The popular midsize Traverse SUV is a major strength of Chevrolet today, in combination with other SUVs Tahoe and Equinox and pickups Silverado and Colorado. As more and more consumers turn toward the truck side of the market, most all midsize and compact sedans this year have suffered double-digit declines in U.S. sales. GM, in shutting down factories for the three Chevy models, along with the Buick LaCrosse and Cadillac CT6 and XTS, is following the lead two years ago of Chrysler, which killed the 200 and Dodge Dart, and Ford earlier this year planning to do away with all its sedans, except the Mustang, by the end of 2019. On a wheelbase of almost 121 inches, the Traverse is considered by some to be a full-size SUV, rather than midsize. It performs with a 310-horsepower, 3.6-liter V-6 engine and smooth 9-speed automatic transmission, with all-wheel drive. Performance is strong, other than, when in manual mode, shifts are attained by pushing a button atop the shifter knob, awkwardly placed. The twist of a dial on the center console moves it into all-wheel drive from two-wheel. The engine turns somewhat noisy under acceleration demand. The Traverse was introduced in the fall of 2008 as an ’09 model. I was driving one in early December ’08, heading north out of Denver following a Denver Nuggets’ win at the Pepsi Center, when I stopped for a red light and the Traverse got popped hard from the rear by a kid heading home from work in a Pontiac. I got out, made sure he was okay, then asked, “Didn’t you see the red light?” “I did,” he said, “but I didn’t think you would stop for it.” While the front end and engine block of his older Grand Am were pushed back toward the firewall, the Traverse showed only slight damage to its rear exterior and had some minor suspension issues. 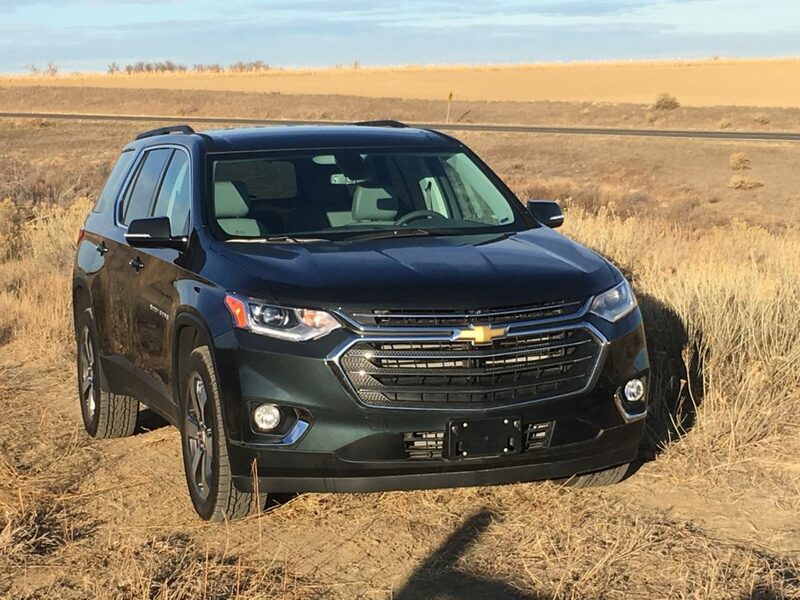 The Traverse’s size in 2019 has been expanded a couple inches from the original to 204 inches in overall length. It competes with the Ford Flex, Subaru Ascent, Dodge Durango and other models. Standard this year for the Traverse interior is MyLink infotainment with 7-inch touchscreen, Apple CarPlay, Android Auto, Bluetooth, six USB ports, Bose premium audio and navigation. The three-row SUV has cargo space aplenty; 23 cubic feet behind the third row and with that folded expands to 57.8 feet. The big Traverse carried us to an early Thanksgiving breakfast at Cracker Barrel in Loveland with Dale and Sandy Wells, Tyler Wells and Seth Blanke. Returning late on Thanksgiving afternoon from Brent and Tina Wells’ home in Windsor, I pulled into the garage, shut the Traverse off and chimes sounded and warning in display message center read, “Rear Seat Reminder: Look in Back Seat.” Sure enough, there rested the leftover pumpkin pie for dessert at another meal. The Traverse rides smoothly and comfortably on Continental 255/55R20 tires, with front struts and rear multilink suspension and coils all around. Overall fuel mileage was 21.8; its EPA estimate is 17/25. The AWD Traverse with 3LT Leather trim level carries a sticker price of $45,090, with surround vision camera, lane-change alert, rear park assist, power rear liftgate, remote vehicle start, leather seats and leather-wrapped steering wheel, and tri-zone climate control.